Welcome to the clavinova page of the Yamaha section. In this page I'm going to introduce you to one of our favorite digial pianos. 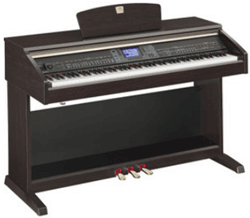 The clavinova is a fantastic digital piano and in a moment I'm going to tell you exactly why. Many students woder what the word Clavinova meant. Well, The word Clavinova come from the word 'Clavier' which means keyboard in French. The Yamaha Company has invested a lot of research and money in order to produce such a keyboard. It's not for nothing that the Yamaha Clavinova series is one of the best and most popular digital pianos in the world. What is the reason that musicians all over the world choose the Yamaha Clavinova? Well, basically they have succeeded to produce instruments that have the sound and touch of an acoustic piano. These are the most important issues when looking for a digital pianos. Some digital pianos have various features in their system but you should get blinded by it and check instead if the instrument feels and sounds like a piano. Here's how manufacturers of digital pianos try to reach the sound of a real piano. What they often do is record the sounds of an acoustic piano and install them in the instrument, so, when you play a key on the keyboard you hear a recorded sound from a real piano. In order to capture the real sound of an acoustic piano you should have a very sophisticated technique that will capture each note of an acoustic piano which is then sampled in various velocities and recorded on a chip. Yamaha created the Advanced Wave Memory - an exclusive patented process which captures not only the sound of an acoustic piano, but its harmonic structure as well. This is the reason why so many people love the sound of the Yamaha Clavina and even find it hard to tell if it is a real or a digital piano. Here's another advantage of the Yamaha Clavinova: When you press the pedal of this instrument you should get a similar effect to the one existing in an acoustic piano. So when checking the different models of the digital pianos, don't forget to listen to the sound while using the pedal and make sure you're convinced by it. The Touch - The Graded Hammer Action. Have you ever noticed that the keys in the high range of an acoustic piano are often lighter than the ones in the lower range? (High range=the right side of the keyboard, low range= the left side of the keyboard). If you come across an acoustic piano try to play a little bit and see it for yourself. The Yamaha company have created The Graded Hammer Action in order to immitate the piano action of a real acoustic piano. The Graded Hammer Action works in a way that the keys are gradually heavier top to bottom, and by that you gain the same touch as a real piano. At the beginning of my career I had already played for hours on an acoustic piano. I decided to buy a digital piano in order to play in gigs and to play with my friends. The one that I bought didn't include this special feature. Well, when I was playing the low bass keys the result was embarrassing. The sound of bass keys was extremely loud and annoying. I was used to an acoustic piano. I was used to pressing harder on the bass keys because that's how an acoustic piano works. And then, while playing on a digital piano without the Graded Hammer Action, pressing harder on the bass keys - the result was an extremely loud sound. So if you're going to buy a digital piano make sure it have the Graded Hammer Actionc to save yourself from this unpleasent experience. Get yourself a digital piano with the Graded Hammer Action. It's a little bit more expensive, but it feels so much better and the sound is just terrific. Right now I'm going to introduce you to the two main models of Yamaha Clavinovas â the CLP and the CVP. Let's start with trying to understand the difference between the CLP and the CVP. The CLP is a pure digital piano with just a few electric options. If you're looking for a handy alternative to an acoustic piano - smaller, cheaper, with the ability to play more quietly you should consider this one. 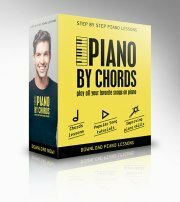 The CLP includes a small bank of sounds such as pianos, electric pianos, strings, and you can even connect the CLP to a computer and record yourself, but usually you don't get very much more. The CVP is a digital piano as well, but includes a wide range of interactive musical features. If you're into performing and recording music I would say the CVP would allow you to do a lot more with it. Sounds bank - Many keyboards include hundreds of different voices. So deos the Yamaha CVP. What is their advantage in the world of sounds? Remember what I said about the "Advanced Wave Memory (AWM) "? This technique of recording allows the different sounds to be more authentic. I must say that some of the voices such as trumpets and flutes do not sound so authentic, but the newer the instrument is, the better the sounds. Display screen - I love the screen of the CVP. It helps you to control all the features and the options in the CVP. The Yamaha Clavinova LCD screen is big, and I find it convenient, and very effective. Recording - With this instrument you have 16 different channels to record with. It's like having a mini orchestra in one instrument. Accompaniment - This feature is a must for someone who plays in gigs. With this feature you can actually eplace a whole band with just one instrument. 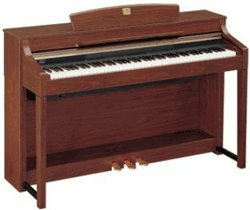 The Yamaha Clavinovas (CVP) have a huge bank of styles. You just have to choose the one that you need and getting jiggy with it. So where should you buy a Yamaha Clavinova? The best thing you can do is to go to the local music store, to play and listen to various instruments. Feel the touch, and listen to the sound. Only then, compare their prices with other stores. Today it is very easy to compare prices since there are hundreds of web stores. Here is a good and reliable web store with good prices and a good service (Coming soon). Read some reviews and make your own research. Now that you know the differences between the two series of Yamaha Clavinova, we recommend that you read more about the various models. CLP-220, CLP-230, CLP-240, CLP-270, CLP-280, CLP-265GP, CLP-295GP, CLP175.